It is a water fall situated at K.R Nagara taluk, Mysore Disrict, around 50 km from Mysore. It is said that it is the holy place where Lord Sri Ram during his vanvas stopped by and availed the hospitality of a tribal couple called Chuncha and Chunchi and hence the name Chunchanakatte. In kannada 'Katte' means bund. An ancient temple dedicated to Lord Rama is found on the banks of River Kaveri. The temple timings are from 9.00am to 12 noon and 6.00pm to 7.00pm. A natural waterfall with surrounding greenery makes this place a good picnic spot also. A hydro power project is also located here. 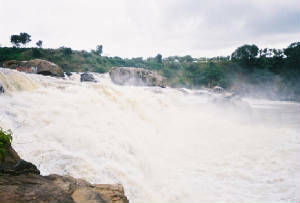 The best time to visit would be immediately after the rainy season so that you will find the place as a waterfall.! Food and water ara available at the place. You can stay at K R Nagara.